Exercise: The Key to Better Grades? For better or worse, we live in an increasingly competitive world, which means when it comes to education, grades matter – big time. While they don’t necessarily reflect the learning process, effort expended or lessons learned, grades remain an important indicator of knowledge, critical thinking and other variables that translate well into adulthood. And of course, when applying for college, few application reviewers consider the straight D student, even if that student gave 100 percent in the classroom every day. With all the tutoring clubs, online support groups and other tools at students’ / parents’ disposal these days, it’s encouraging to know a simple grade-booster exists that doesn’t require money or even a great deal of extra time: exercise. Research suggests children who exercise more perform better in several academic subjects and are more attentive compared to their less-active peers. The most recent study to examine this association reviewed 26 studies involving more than 10,000 children ages 4-13. 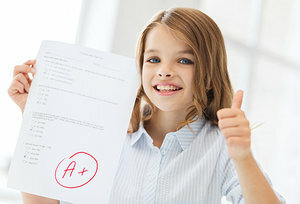 Results, published in the peer-reviewed research journal Pediatrics, showed that increased physical activity, particularly physical education, improved various aspects of academic achievement , “especially mathematics-related skills, reading, and composite scores.” Students who exercised more also appeared to stay more focused on their schoolwork than students who exercised less. In the studies analyzed, researchers increased physical activity levels through expanded recess, afters-school sports or active breaks between lessons throughout the school day – which also may suggest academic performance is related to whether kids get breaks from their long days sitting in the classroom. Definitely food for thought for the education system. From a parent standpoint, teaching your kids to exercise and encouraging them to take active breaks at home, particularly while doing schoolwork or studying for quizzes / tests, could help their academic performance – and will certainly help avoid the health perils of a sedentary lifestyle. Talk to your doctor for more information.